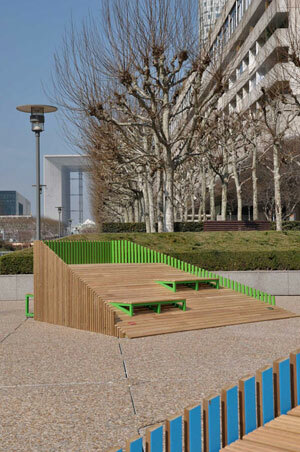 Bustler writes that Ferpect, a French design collective, recently won the top prize at the French street furniture design biennale for their work Dune, which is being exhibited at La Défense square in Paris until the end of the year. Ferfect is a group of architects, engineers, and thinkers. 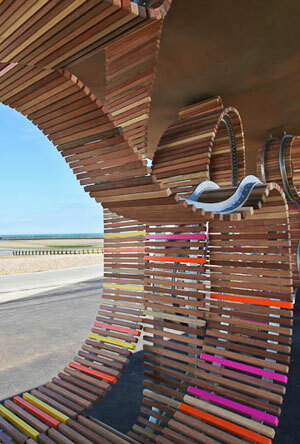 Ferfect says their Dune system is a piece of “micro-architecture” that can be moved around depending on the climate. The front side of the 20-degree acacia-wood slopes allows for sunbathing and people watching while the rear frame of pine slats provides shelter from the wind or sun. Ferfect thinks their “interchangeable and easily transportable modules” could be assembled into larger islands. Like a real dune, the system could be highly changeable, evolving with the elements, moving from place to place in a park. 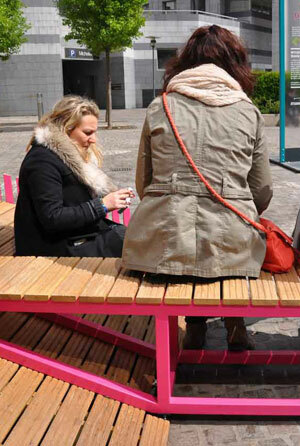 We could these popping up in the many empty, underutilized plazas in downtowns across the globe. The Shape of Green aims to address these problems by creating new guidelines for sustainable design that encompass both environmental ethics and aesthetics. 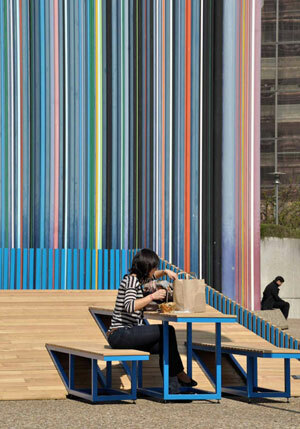 He identifies three guiding principles for design: conservation, attraction, and connection. Conservation means the efficient use of materials: buildings that do not use materials superfluously generally require fewer resources to produce. Additionally, the arrangement of these materials (the form of the building) influences energy efficiency. Attraction means beauty, or the way a design appeals to us. 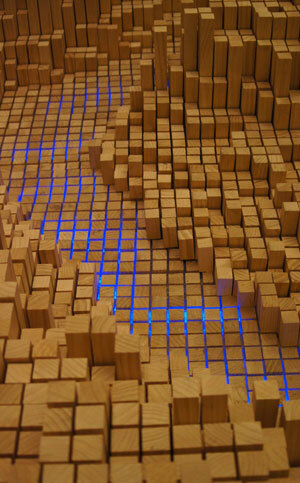 Hosey discusses beauty in terms of patterns and geometries that people are hardwired to enjoy. He repeatedly comes back to the concept of biophilia, our inherent attraction to the aesthetics of nature. 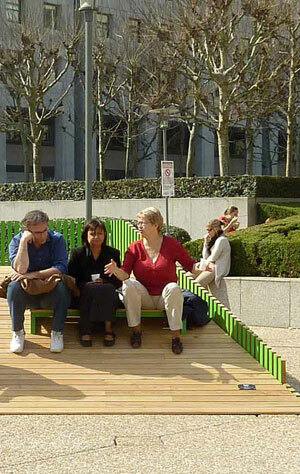 Designs can appeal to these predispositions by emulating the sensory experience of nature. 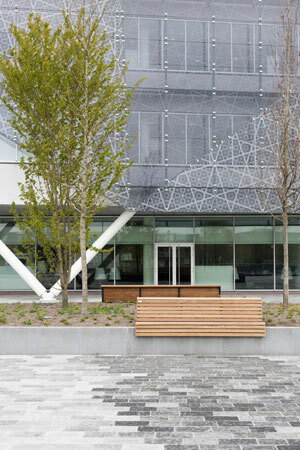 For example, a perforated building façade can evoke the visual experience of a tree canopy. Connection means a building’s attachment to place. Hosey argues for a bottom-up approach to design, asserting that all architecture should be designed for its environmental context. He writes, “designers can expand on the many indigenous and vernacular traditions in which buildings and land unite to become a part of place, embodying the unique geographic essence of locale.” In other words, a building design should work with, not impose on, the unique qualities of its site. In addition to being less environmentally damaging, sustainable architecture can also be beautiful. This beauty should come from its natural setting. By connecting aesthetics to place, sustainable architecture can be more unique and therefore more culturally enriching than traditional architecture. He slams Frank Gehry’s buildings for not only being wasteful in terms of material use, but also insensitive to their contexts. Though perhaps beautiful, Gehry’s buildings could be anywhere. We see this insensitive attitude in any number of suburban subdivisions; imposed on their sites, they have few distinctive qualities, little sense of place, and are environmentally destructive. By ignoring context, buildings become devastating to both ecology and culture. 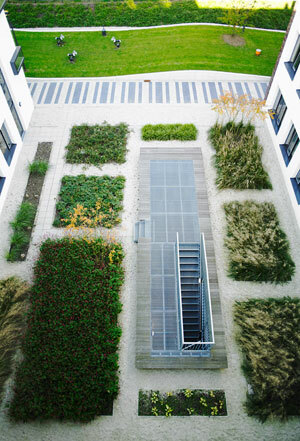 Hosey switches between scales, moving from sustainable buildings to the form of sustainable cities. He argues that cities should be responsive to their natural settings, and he even touches on the idea that cities should perhaps be viewed more as landscapes than as collections of buildings. He explores planned “green” communities like Masdar City, but ultimately concludes that spontaneous communities such as favelas have more to offer us. Completely unplanned, favelas arise entirely from their people and their locations, not the top-down imposition of plans. Of course, the idea of cities being tied to place is not exactly new to landscape architecture, and Hosey seems more interested in how communities relate to their surroundings aesthetically than ecologically. While he mentions urban ecology, he doesn’t describe it beyond urban forestry and agriculture. A more thorough exploration of how site ecology can lead to urban form would have been nice. As a result, this book may be more interesting for architects than landscape architects. 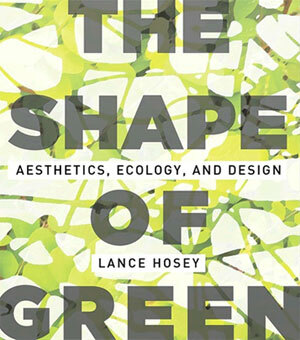 For The Shape of Green, Hosey draws from an incredibly diverse range of resources, yet he sometimes over-simplifies complex subjects and relates debatable points as fact. While this approach certainly keeps the book from becoming boring, it can sometimes undermine it. Also, in some sections, The Shape of Green can have an overly casual tone (the book’s colorless images don’t help the matter). Still, Hosey focuses on the important issues, and his argument for the blending of aesthetics and environmental ethics is compelling. The relationship between sustainability, ecology, and aesthetics is certainly worth further investigation. 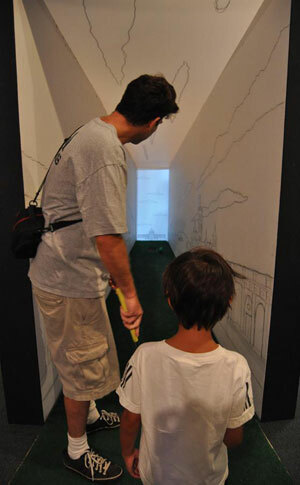 So how hard could a mini-golf course designed by architects, landscape architects, and building contractors actually be? Turns out kind of hard. 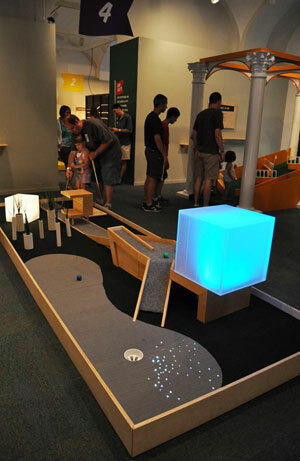 All 12 holes at the National Building Museum’s mini-golf course offer unique challenges this summer, even for mini-golf pros (if those exist). Holes range from par 1 to 4, but, unfortunately, your two mini-golfers went way over, scoring a gutting 45 and 38, zooming far past the par for the course: 30. Clearly, the holes were either designed by some devilish masterminds to be excessively difficult, or by an accident of materials, ended up being so. 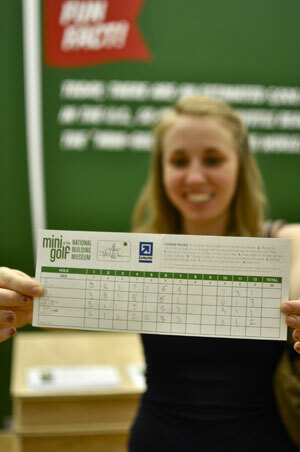 Let’s start with the pleasant mini-golf experiences. 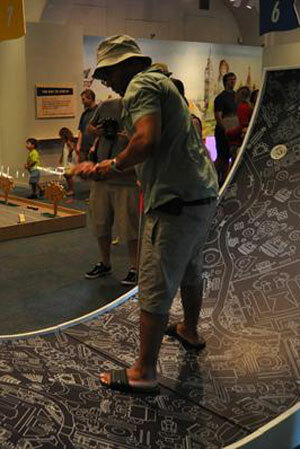 The hole, Take Back the Streets!, which was designed by landscape architecture graduate students at Virginia Tech’s Washington-Alexandria Architectural Center and sponsored by the American Society of Landscape Architects (ASLA), can be played in 3 strokes or less. In this educational hole, ASLA and the students show how green complete streets can transform communities. The stormwater management systems — the swales — function as traps. 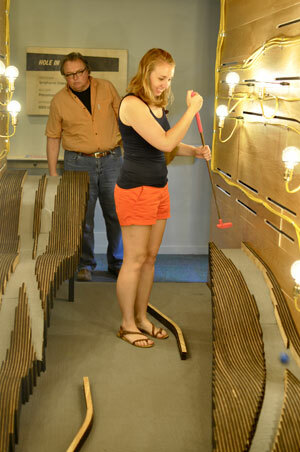 Golfers can play through the wood laser cut-trolley or bounce off the bicyclist. Our players scored a 3 and a 2. Not bad, we were at par or below. 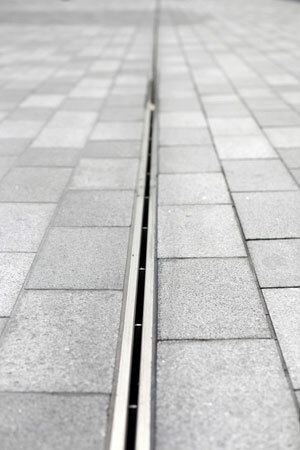 Canal PARk, another hole involving landscape architects — this one by OLIN and Studios architects, the creators of the upcoming Canal Park in the Navy Yard neighborhood of Washington, D.C. — was a great playing experience. While the design calls to mind the grand Modernist landscapes of the late 50s, we were just happy the ball actually went where it was supposed to. Not sure this was a par 1 though. We scored a 2 and a 3. 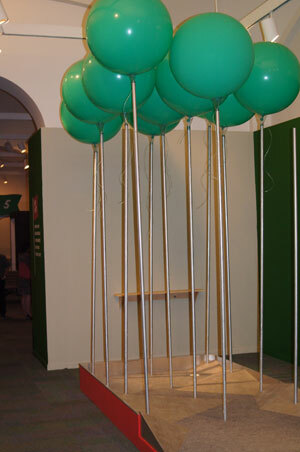 Another landscape architect, Jonathan Fitch, ASLA, at Capitol Hill-based Landscape Architecture Bureau, took full advantage of the 7 feet height limit the museum set. 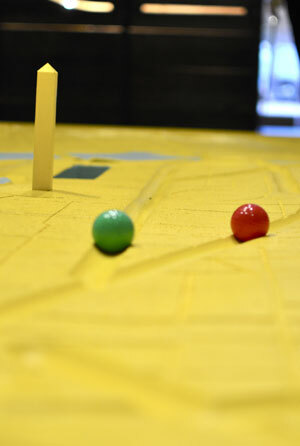 Using a set of helium-filled balloons and a zig-zag floor pattern, he created a tricky yet ultimately playable hole. We both scored 2s, making par. Architecture mega-firm SOM‘s Confluence, which maps out the underlying topography of the Anacostia and Potomac rivers, is beautiful to behold but a bumpy play. We got a 3 and a 4, over the par of 2. The glowing river floor must have been distracting. Now for the challenging ones: Ball on the Mall by E/L Studio offers what seems like an easy shot straight through to two different holes from three different tees. But the texture of the grooves in this terror of a hole shot our ball right off the course (twice). Argh. We scored a 5 and a 6 on a par 2. Debacle. Grizform Design Architect‘s Hole in 1s and os, which has undulating forms and lighting set within a black box, proved to be too much. Balls went flying out the back end of the hole, bypassing the cup by yards. Scoring 4s, we thought they needed some barriers at the end. Another hole entitled Mulligans on the Mall by Wiencek + Associates Architects + Planners almost requires a protractor to plot out the appropriate angle of attack. Oh so tricky astroturf also proved a challenge. Your blogger scored a 6 on that one, giving up just before throwing the putter at the hole, while our associate got a 2, but then he may have had beginner’s luck. Now for the absurdly difficult: Hargrove‘s half-pipe has taken down most mini-golfers (we’ve heard), who either manage to make it in the first shot or don’t make it at all. We proved our merit, scoring a 2 and a 3 for a par 4. Probably not a score either of us could repeat though. Go to the NBM before September 3 to see how you do. It’s hard to imagine how you could spend $5 elsewhere to get the same amount of fun (and stress). In cities across the United States, bicycles are becoming an increasingly popular form of urban transportation. A survey of 55 major metropolitan areas in the U.S. found that bicycle commuting rates increased, on average, 70 percent between 2000 and 2009. Bicycle commuting is particularly popular in the Northeast and Northwest, with many cities in these regions seeing ridership double or triple. While bicycle commuting still represents a small percentage of overall commuters (the nationwide leader, Portland, still only has a 5.8 percent bicycle commuting rate), the rising enthusiasm for bicycles is undeniable. The growing popularity of urban cycling has led to a proliferation of bicycle infrastructure in many cities. Over the past decade, Washington D.C. has laid down over 50 miles of bicycle lanes (much of which has been designed by landscape architect Jennifer Toole). 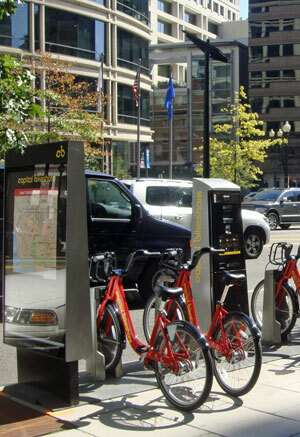 Additionally, the District has instituted a popular citywide bicycle sharing program – Capital Bikeshare (see image above). Funded through a public/private partnership, Capital Bikeshare utilizes over 1,500 bicycles across 165+ stations. 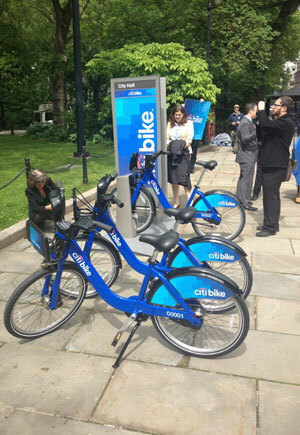 New York City is preparing to launch a bike sharing program of its own, Citi Bike. Unlike Capital Bikeshare, Citi Bike is fully privately funded (the lead sponsor of the program is, logically, Citibank). The program will be the largest of its kind in North American, consisting of 600 stations and 10,000 bikes and covering a swath of Manhattan, Brooklyn, and Queens. Though Citi Bike is generally popular – a 2011 poll found that 72 percent of New Yorkers support the idea of a bike share program – some find it to be too expensive, especially compared to similar programs in Washington and London. Still, Citi Bike represents an entirely new transportation network and will likely have an impact on the bicycle’s role in NYC. Even some sprawling, car-oriented cities are beginning to reconsider the bicycle as a viable form of urban transportation. For the past three years, Los Angeles, a famously car-oriented city, has temporarily prohibited cars from driving on designated streets for certain Sunday afternoons, says Places. 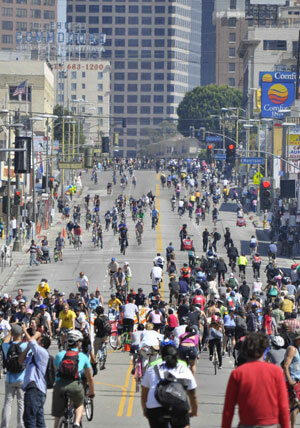 The event, CicLAvia, lasts for five hours, allowing citizens to bike across their city free from automobiles. By making the roads open and safe to all riders, CicLAvia intends to change perceptions of Los Angeles. In a city famous for gridlock, the streets can be perceived as public space and disconnected neighborhoods can be experienced as continuous urban space. While only a temporary event, CicLAvia aims to convey the potential for cyclists and pedestrians to safely navigate a city traditionally viewed as inexorably bound to the automobile. Though growing in popularity, bicycle ridership in America has not yet begun to approach the level seen in many other countries. According to a 2008 report by the Earth Policy Institute, in 2005 China had an estimated 435 million bicycles on the road. This staggering number actually represents a 35 percent decline from 1995. During this same time period, private car ownership has more than doubled, rising from 4.2 million in 1995 to 8.9 million in 2005. While bicycle culture is expanding in America, in China bicycles have come to be viewed as utilitarian and old-fashioned, writes the Asia Blog at The Asia Society. Some Chinese cities have gone as far as removing bike lanes or banning bikes from certain streets. However, as the social and environmental cost of cars becomes apparent, the Chinese government has recently to promote efforts to rekindle enthusiasm for bicycles. In 2007, a bike sharing program was launched in Hangzhou, a city of 7 million in southern China. The program has ballooned to over 50,000 bicycles across 2,050 bike stations, by far the largest bicycle sharing system in the world and is planned to expand to 175,000 bicycles by 2020. Additionally, in an effort to ease congestion and air pollution, Beijing is getting ready to launch a bicycle sharing program of its own. Another form of city center, a new town hall square in Solingen, Germany, by German firm scape Landschaftsarchitekten, is an “urban living room” for the municipal workers in the surrounding building. Again, a bold geometric pattern is used to create a striking landscape. The design team writes in Landezine: “To build a coherent area, a pattern of black and white lines traces the whole public open space. 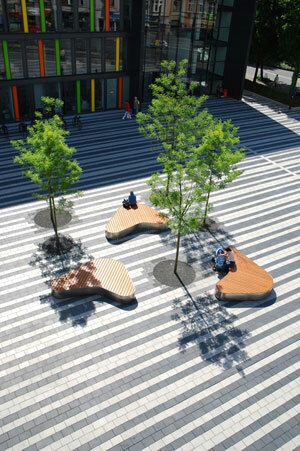 Like a marquetry, a connecting concrete carpet integrates various functional elements and provides zones with different characters and uses.” The central square is defined by the pattern, as are the sides of the green spaces, which allow for movement. 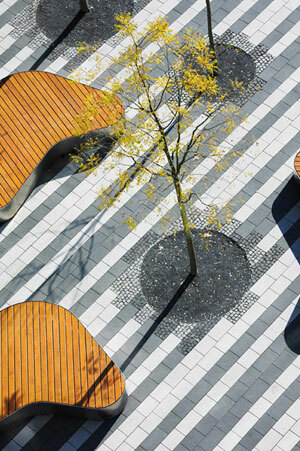 Four courtyards then serve as a “counterpart to this open, lively square.” The courtyards are arranged as “abstract gardens.” Notice how the black and white pavers transform into less hard-edged strips of gravel, with plants coming into the mix. 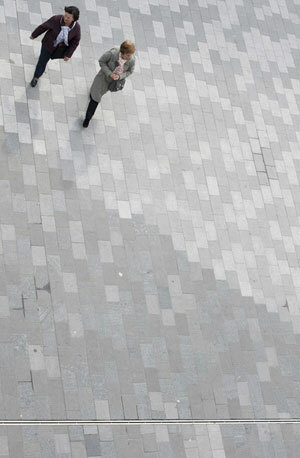 In fact, wherever nature appears, the black and white pavers seem to disintegrate. 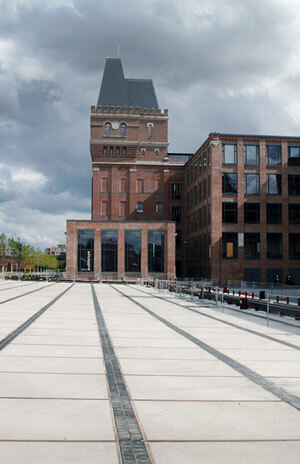 In Pas-De-Calais, France, the old textile mills along the banks of the Haute Deûle canal are being transformed into a new park. Designed by Atelier des paysages Bruel-Delmar, the project pays honor to the canals and irrigation ditches, but creates something new as well. 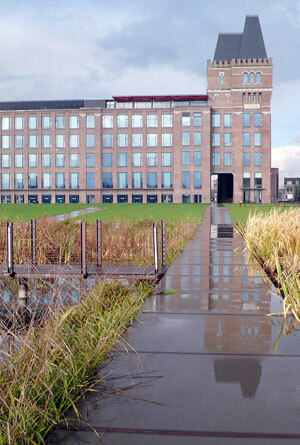 Working class factories and dorms are now office buildings for high-tech workers. Public spaces and a new water garden filled with phytoremediating plants draw in residents from the community and techies taking a break. 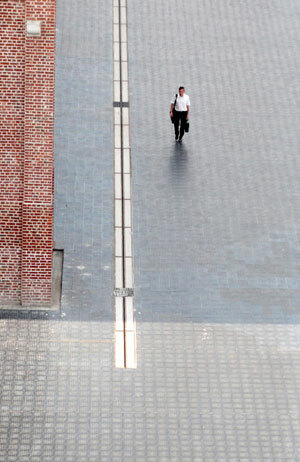 The design team wanted to create new public spaces without “depriving this quarter of the charm that resides in the proportions of the streets bordered with worker houses.” A new courtyard creates the sense of a hard linear park that respects the working class vibe, while pavers made out of concrete and industrial basalt create texture along paths. In the race to be greenest among the more progressive cities in the country, Washington, D.C. is no laggard. According to a recent Economist Intelligence Unit report, the city ranks eighth among all North American cities. Impressive as that is, D.C. still remains far behind top performers like San Francisco and Vancouver so the city government under Mayor Vincent Gray has initiated an ambitious new plan, SustainableDC, with the goal of becoming number one in a generation. After months of public review sessions and advisory committee meetings (your blogger was involved in the climate change committee), Mayor Vincent Gray is trying to make many good ideas more concrete, turning them into regulations and laws. In a hearing held this week, seven bills were considered by the City Council, while two related to energy efficiency have already passed. Here’s a run-down of what Gray and his able team at the Planning office and District Department of the Environment (DDOE) are hoping move forward now. The “Energy Efficiency Financing Amendment Act of 2012” would increase access to private capital for energy efficiency. The Property Assessed Clean Energy (PACE) pilot program, which is a “$30 million energy retrofit pilot backed by private capital,” would serve as the down payment on a $250 million program. New rules being proposed would enable water and stormwater infrastructure — what we assume to mean green roofs and the strategic use of trees for energy efficiency — to be eligible for PACE financing. This is really smart because as an ASLA animation demonstrates, green roofs and trees can be very effective at reducing energy consumption. The D.C. government says PACE could “inject hundreds of millions of dollars into the District economy each year,” creating tons of green jobs. Those incentives could also make the city greener, literally. The “Clean and Affordable Energy Benchmarking Amendment Act of 2012” will establish a green building benchmarking program. “This program, one of the first of its type in the nation, requires disclosure of EnergyStar portfolio manager scores for all private buildings over 50,000 square feet.” Rolling out in 2012, the program will require “industry education support, data management, and enforcement” — efforts all geared towards improving D.C.’s already substantial progress on green buildings. The city seems to realize it needs to get more serious about removing the obstacles limiting renewable energy production, which has taken off elsewhere in the U.S. far faster. 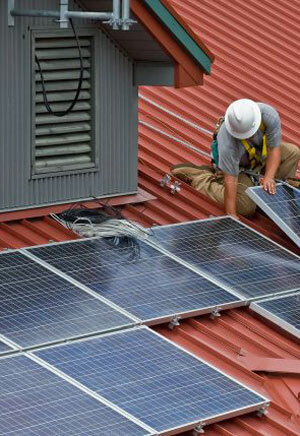 The “Renewable Energy Incentive Program Amendment Act of 2012” would allow the DDOE to continue to offer rebates to District businesses and residences that install renewable energy systems. On the same front, separate from SustainableDC initiatives, the City Council also debated new measures to boost both residential and industrial-scale solar power and co-generation energy and heat plants (mostly geothermal systems) by making regulations clearer and reducing property taxes. The “Energy Innovation and Savings Amendment Act of 2012,” would enable excuse 3rd party vendors — the firms that provide low-cost financing and installation of renewable energy systems — from paying nearly 3.5 percent in property taxes. As Councilwoman Mary Cheh (and interim Chairwoman of the City Council) noted, “this may be needed to become more competitive with Maryland and level the playing field.” By giving up the extra taxes, more renewable energy investment could come, creating more valuable properties and therefore more property taxes. Right now, the District only has a few large-scale solar plants, totalling 5 mega-watts. Two of the biggest plants creating some 900 kilo-watts of power are on the campuses of American and Catholic universities. In the hearing we attended, we also heard how the City Council is considering bills that would give electric vehicles a fighting chance in the District, which is great news. So few cities have incentivized the development of electric vehicle (EV) infrastructure — the charging stations — really needed to make EVs a reality. NRG Energy’s EV-Go system, which is a subscription model that “reduces up-front costs,” could be a good fit for the District. The city seems to be responsive to that firm’s interest in rolling out charging stations and serious about removing any regulatory obstacles that could limit the range of sites. Still, Cheh asked pointed questions about EV demand, the cost of these charging stations, and the fees each EV owner would need to pay to use the stations. The NRG representative said that “these stations would cost a fraction of the price of gasoline, about less than half.” To tap the “regional ecosystem,” the stations would be put along key routes for commuters, taking up spaces in shopping malls (“retail hosts”) and parking spaces along streets. Exciting stuff. A related program, the “Anacostia River Clean Up and Protection Fertilizer Amendment Act of 2012,” would specifically take aim at the fertilizers used by homeowners and businesses that dirty the District’s waterways, “accelerating the growth of algae and damaging aquatic ecosystems, fisheries, and water quality.” DDOE explains: “Algal blooms have a strong negative impact on fisheries, degrade fishing and boating activities, and harm tourism and property values. Controlling fertilizer use in general — and especially by reducing phosphorous and nitrogen use in fertilizers — will greatly aid the District to meet federal Clean Water Act requirements.” We have to see the details — for instance, will fertilizer use will actually be restricted? — but this may be long overdue considering the Anacostia still ranks as one of the filthiest waterways in the U.S. Bees are in trouble so the District seems to be moving on this critical issue. In the “Sustainable Urban Agriculture Apiculture Act of 2012,” homeowners will now be allowed to legally raise honeyebees, which play a symbiotic role in home gardens and help produce fruit and vegetables in the District. All that wax and honey could help fuel the growth of new local industries, too. Even if all of these measures pass the Council, D.C. will need to do much more to be number one. Hopefully this is just a good start. Explore D.C.’s Sustainability vision and the legislative proposals before the council. Also, check out an interesting article in The Architect’s Newspaper on recent urban planning innovations in D.C., like the Southwest eco-district. In Urban Composition: Developing Community through Design, Professor Mark C. Childs, who teaches architecture at the University of New Mexico, declares that “settlements are not just the sums of their parts; their poetry and vitality comes from their collective composition – the interactions among multiple designs.” In other words, it’s the way multiple individually-designed pieces work together that leads to the overall success of a place. 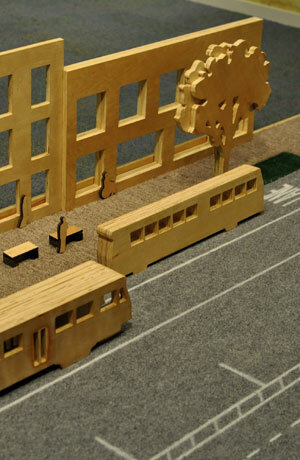 These pieces include buildings, parks, streets, and works of public art. 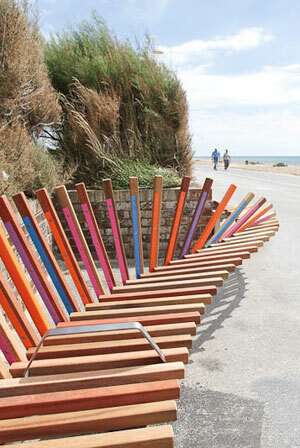 Each of these components is individually crafted by an architect, landscape architect, or artist. Childs argues that good urban design occurs through a concinnity of these components. He defines concinnity as “the skillful and harmonious adaptation or fitting together of parts to craft a whole.” He writes “great places emerge from the concinnity of incremental acts of design. Existing work frames new projects, which in turn inspire future works.” Each designed element should innovate while still drawing from the existing cultural, environmental, and physical context. In this way, the components of a city can be individually interesting and part of a coherent larger whole. Childs mentions public works, projects that “have a principal goal of providing a collective good or service to a catchment or district.” These projects, frequently known as urban infrastructure, influence the built form that falls within them. “By providing a public utility and structuring a district,” Childs writes, “public works create a pattern of niches for various built species.” As an example, ecological systems that provide services — including biodiversity, flood control, and stormwater filtration — can be considered collective goods. 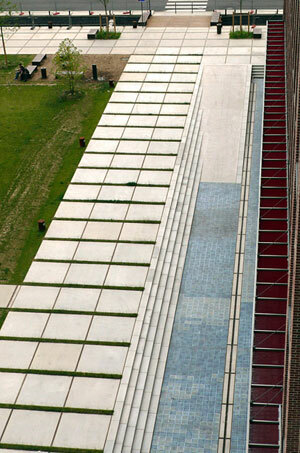 Because these goods are delivered to us through landscape design, our landscapes can be viewed as infrastructure. 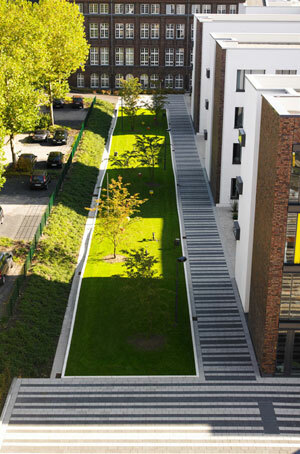 In the same way that a road layout influences how buildings are shaped, landscape infrastructure frames and guides our built forms. The growing awareness of the importance of urban ecology and the increasingly blurred distinction between the natural and built environments raise questions on landscape architecture’s position within the hierarchy of urban design. Isn’t ecological infrastructure now playing a larger role in making our cities more unique, boosting the role of landscape architects in the process? 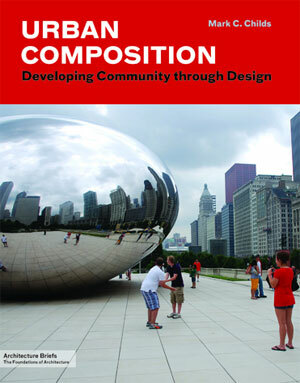 While Urban Composition tends to be architecturally oriented, it’s an interesting read for any urban designer. 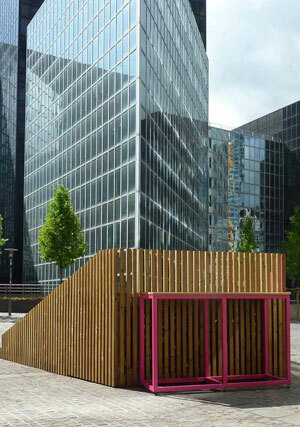 Childs effectively communicates the ways designers need to consider the context of their designs, as well as their professional roles, in order to contribute to a successful urban composition. After all, the greatness of a city doesn’t depend on its individual buildings or parks, but on how those components work together.